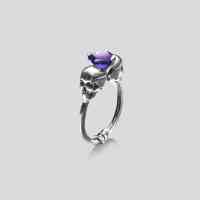 Love, death and beauty all intertwined... Just like the gorgeous stone set in this beautifully dark solitaire ring. Adorn your finger with this delicate creation and see the 7mm hexagonal stone weighing approximately 2ct sparkle in its intricate skulls setting. Personalise your own solitaire ring to suit your style. Choose from 18 carat rose, yellow or white gold, and a range of stones including amethyst and topaz for a unique piece.